Today I thought I would bring to you a review of one of my favourite eye shadow palettes to date; the MAC Warm Neutrals Palette. Anyone who's familiar with MAC products will know that this, and the Cool Neutrals Palette has been in high demand, and every time I got an email saying it was back in stock, by the time I went to purchase it online it was out of stock again! For some reason when you can't have something, it always makes you want it even more, right? Anyway, I finally got my mits on this palette about a month ago and I've had some time to play with it. First thing I want to say about this palette is that it is amazing value for money, priced at £65 for 15 shades, with a single MAC eye shadow being priced at £10. If you were to customize a 15 shade palette yourself, it would cost you a whooping £150! I think it's safe to say the savings are obvious. 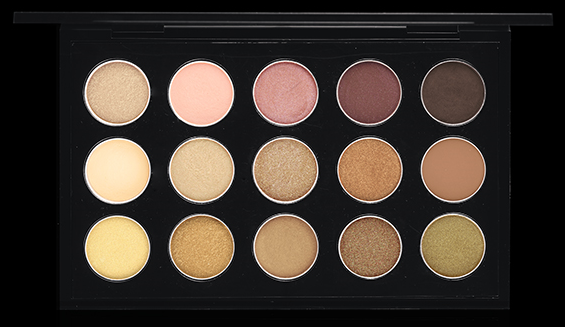 MAC eye shadows are renowned for their quality, in terms of pigmentation, longevity and a vast selection of colour shades to choose from, and this palette is definitely a representation of that. I have been reaching for this palette on a daily basis, and have found that with or without primer this eye shadow still remains on my eyes all day (even in the hotter months where everything on our face tends to slide in places we don't want them to..). The main difference I found with putting them onto a primed base is that they appeared slightly more vibrant, and true to the colour in the pan. One of my pet peeves with eye shadow is fall out, especially when it comes to glittery shades. As much as I love my beloved Urban Decay Naked Palettes every time I go for a glittery shade I end up with a face like a disco ball! I am happy to report that with this palette the glitter stays where it's supposed too.. on your eyes! So let's talk about the shade range in this; in my opinion every colour in this palette is wearable which is what you'd expect from a neutrals palette. There is enough lighter shades and dark shades for this palette to be transitional from day to night, and I have used it for both. There's a good balance of glitters and mattes, however if I was to change one thing about this palette I would add a lighter matte brown as the dark brown shade (Dance In The Dark) can sometimes be a little too dark for daytime use. The shades I've got the most use of out of this palette are actually both the two darker shades; Divine Decadence and Dance In The Dark as my go to look is usually a slightly smokey brown eye. I often go for Vanilla Extract as an inner corner and brow highlight.